PASADENA — The Pasadena Buddhist Temple Obon Festival will take place July 19-20 from 4 p.m. each day at 1993 Glen Ave. in Pasadena. Obon is a time when we gather to show our appreciation to family and friends who have passed from this world. Rev. Tetsuo Unno will be available for questions both days from 5:15 to 6:15 p.m. inside the temple Hondo. Obon dancing will take place each evening at 6:30 p.m. A taiko performance at 7 p.m. (L.A. Matsuri Taiko on Saturday, Taiko of West Los Angeles Buddhist Temple on Sunday) will be followed by more Obon dancing. 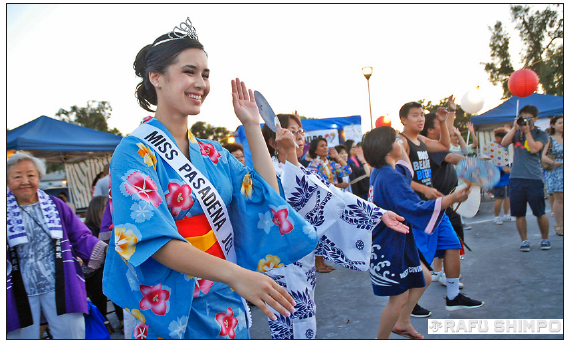 On Sunday, the 2014 Nisei Week Court will be introduced at 6:20 p.m.
Visit the temple’s website to get the schedule of martial arts demonstrations. Tea ceremony will take place on Sunday. Ikebana will be on display both days. Vendors selling crafts, jewelry and other handmade items will be available both days. Heritage Source Booksellers has arranged to have author Lora Nakamura sign her book, “The Bonsai Babes,” both days. A variety of foods will be sold, including unagi donburi, chicken teriyaki, Spam musubi and beef teriyaki. Game booths will be set up for kids and adults. There will also be a silent auction on Saturday. For updated information and religious schedules, go to www.PasadenaBuddhistTemple.org.